When I was young, dad and I would go foraging in the nearby woods for mushrooms. I remember how excited I was to find what I then referred to as a “toadstool”, pointing it out for my dad to give me the okay: “edible” or don’t touch. I learned to avoid the ones with yellow undersides and seek out those with beautiful taupe underpinnings. I will never forget the smell of sauteeing fresh mushrooms; one of my fondest memories. Little did I know at that time that mushrooms were a nutritional powerhouse. I simply loved them for their buttery taste. If you haven’t tried before, mushrooms are a food to add to your foodie inventory. Before I knew better I considered them mostly plump little water carriers and not high on the nutritional scale. Was I wrong! Simple, plain white button mushrooms beat tomatoes, green peppers, pumpkins, zucchini, carrots, and green beans in antioxidant content. Dr. Terry Wahls, a physician who single-handedly put her MS into remission with a nutrient-rich diet full of vegetables and fruits, speaks of mushrooms as one of the strongest of veggie species and includes a heavy dose of them in her protocol. Shitake mushrooms, in particular, are one of my favorites and considered one of the world’s healthiest foods. The high nutrient density of mushrooms makes them a top detoxing food, supplying the nutrients our immune and natural detox systems need to do their work. They can be eaten raw or cooked, although they lose some of their nutritional value when they hit the oven or skillet. This recipe is so simple and takes only a few minutes of prep and cutting. Toss mushrooms with a light coating of olive oil, salt, and pepper. Do not overdo the oil. 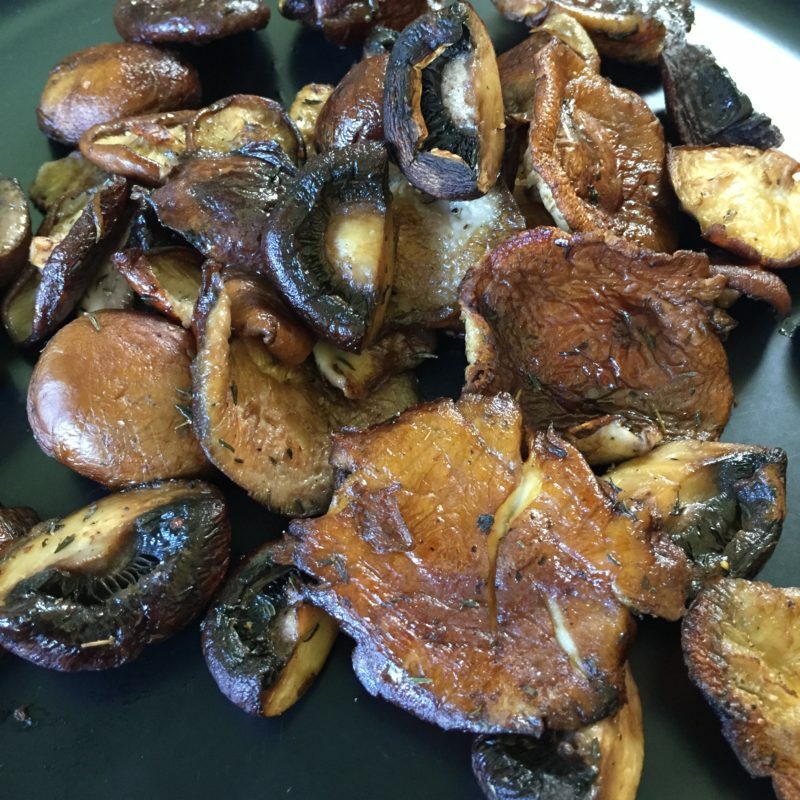 Mushrooms shrink dramatically as they cook and you don’t want to create a slimy, oily mess. Roast until tender and slightly browned – about 20 minutes and a little longer if you want to crisp them up. Optional – sprinkle with chopped fresh herbs like parsley, cilantro, or thyme and top with a slab of pastured butter or sour cream, or just leave them as is and savor them!